Round up your mates for the Mighty River Run and join the flotilla on the spectacular Murray River to support kids living with disability in South Australia. Each crew member is required to pay a non-refundable registration fee of $575. Secure storage of cars and trailers at Renmark, including shuttle return to Murray Bridge from Renmark. Clothing, personal products, towels etc. The 2019 Mighty River Run is a fundraising event, raising money for Novita. There is a minimum fundraising amount of $6,000 per crew and all funds raised for Novita must be forwarded to the organisation, due prior to the commencement of the event. This is the minimum fundraising amount however crews are encouraged to raise additional funds to support even more Novita kids to reach their goals. All funds raised and donated are non-refundable. Money can be donated directly by the crew, or funds can be raised through various events, raffles and other fundraising activities. Novita will be with you every step of the way to support your fundraising, including the provision of equipment (banners, marquees etc. ), downloadable collateral and other fundraising tools such as donation tins and receipt books. Additionally, Novita will provide you with on-going communications with lots of tips and tools to help you reach your fundraising goal. Check out our fundraising tips and tools here. Included in your Registration Fee is a 2019 Mighty River Run polo shirt for each crew member. 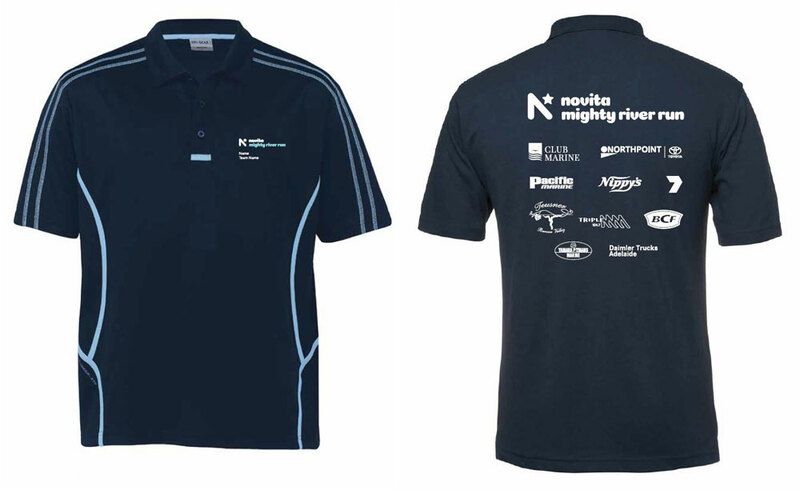 This year’s shirts will again be individualised with your crew name and preferred individual name on each shirt. What size boat is needed to participate in the event? Any vessel that is at least 4 metres in length and is approved to carry you and your crew at a minimum speed of 30km/hr (in ideal conditions) is acceptable. How do I get fuel for my boat during the event? Novita arranges for fuel to be available at each overnight location during the event. Crews are required to advise their needs at the completion of each day and it is then provided at the mooring site the following morning. Fuel is charged at a flat rate for all crews, and is provided in approved 20L containers. What is provided in the registration fee? Details of inclusions and exclusion can be found on the Event Details page . I don’t have enough room on my boat to carry my camping equipment and other provisions, how do I get this between stops? Novita provides transport for all camping, clothing and other items, including spare parts etc., by road for the duration of the event. Items will typically be transported between overnight locations and will be available upon your arrival each afternoon. Novita engages mechanics to assist the Mighty River Run event. Each of these people has a comprehensive background in fixing boats and marine equipment. At any time should you be unable to continue in the event due to breakdown, Novita will arrange for collection of your car and trailer and will retrieve your boat..
How many crew members can I have? The minimum number to make up a crew is 2 and the maximum is the legal capacity of your vessel. Entrants must be 18 years of age or older on 10 November 2019 to participate in the 2019 Mighty River Run. No, not at all. If you wish to upgrade your accommodation, you can and Novita will organise the accommodation upgrade for you. This is done through the registration process. An additional charge will be incurred and discussed at the time of booking. The minimum requirement is $6,575. This is made up of a $575 registration fee (incl. GST) per person and $6,000 per crew, in donations or proceeds from fundraising activities. With an average of 2.4 people per boat, it’s easy to fundraise and we are here to help every step of the way. Raising $6,000 sounds difficult; does Novita assist crews to raise these funds? Novita is committed to supporting each crew raise the minimum $6,000 fundraising target. We will provide you with promotional materials and support for each event/activity held. We can meet to discuss your fundraising plans anytime in the months leading up to the event and we will be sending you emails with lots of tips and ideas to help your crew reach its fundraising goal. What happens if we haven’t fundraised $6,000 before the event? Registrations close at the end of September so everyone has time to fundraise the full amount. We will help you with your fundraising every step of the way with tips and tools. We can also provide you with collateral like posters, donation boxes, banners etc. Of course we do understand that sometimes things happen out of our control that may prevent someone from raising the full amount prior to the event. Don’t worry, we will help you work out a plan to reach your goal and in special circumstances, fundraising can continue after the event. Fundraising officially closes one month after the event. Where can I find the Mighty River Run guidelines?